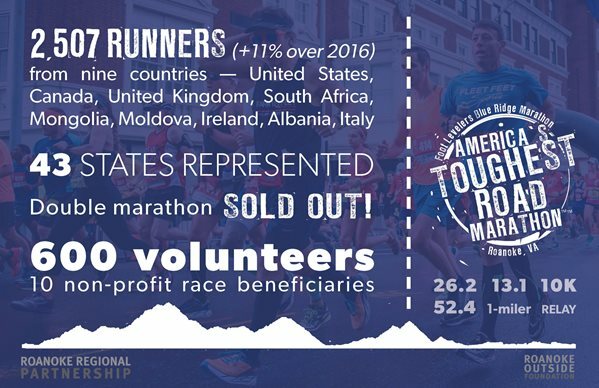 America’s Toughest Road Marathon just keeps getting bigger. And participants have great things to say about the 2017 Foot Levelers Blue Ridge Marathon, even though it was a little damp. Chuck Engle, the Marathon Junkie from Ohio, has run more than 400 marathons all over the world but took on our course for the first time this year. His colorful post-race commentary on Facebook is entertaining, and he’s already committed to tackling the course again in 2018. As the race continues to grow, so does the effect on the region’s economy. Runners from the eighth annual event are being surveyed to measure this year’s impact. In its first seven years, the marathon contributed more than $3.2 million to the regional economy. Start training now for the 2018 race, scheduled for April 21.